The mark of a good series is being able to pick it up at any point and jump in. And luckily The Eternity Cure by Julie Kagawa is a good series. This is a fantastic series in that respect. 5 Words: Survival, vampires, humanity, dystopia, fear. I will confess now to having never read The Immortal Rules. 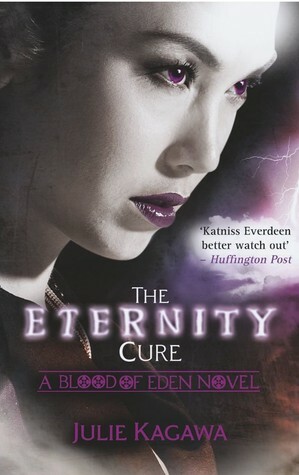 When I won this copy of The Eternity Cure, I didn't even know it was part of a series. But I still enjoyed this book and understood what was happening well enough to not give up read the first book, well, first. It has made me want to read the first book, but I feel that doing so can only enhance my enjoyment of this series and help me better understand the emotions and motives of the characters. This book was up-and-down for me. Some parts felt sluggish and unnecessary, and then others were so intense that I wasn't sure what had happened. It felt for long periods that nothing was happening and then BAM something would happen that just about blew my mind. The best part of this book was the ending, and not because it was the end - far from it. I cannot wait to read the next book, Julie Kagawa you'd better be writing it now! That was a fantastic twist at the end, one I hadn't truly anticipated. And I so badly need to know if what I think has happened is right. If I have one complaint to make about this book, it's Allie's constant, constant mentions of her humanity. I'm all for a vampire holding on to some shred of their humanity - it can make them a very complex character. But Allie seemed to hark on about it every other page. For this reason I much preferred Jackal and his I'm-an-evil-monster-vampire attitude despite the hints that there's still a hint there, deep down inside even if he won't admit it. Allie's humanity, and her seeming obsession with it, made her seem like a bit of a sissy vampire, and goodness knows there are too many of them in the realm of young adult fantasy. So, read away. It's a great book in many respects. Just ignore Allie and her humanity. What's your favourite vampire story? I am so jealous you keep winning all these books!